The holidays are here and we couldn’t be more excited! While we love the holiday season, we also recognize that with more of our clients spending time in the kitchen cooking extravagant meals, baking delicious sweet treats, and hosting out-of-town guests, the likelihood of experiencing a plumbing issue is heightened during this time. As your trusted plumbers in Austin, we have some tips that may help you avoid common plumbing problems this holiday season, so keep on reading to learn more. Extra people in the house during the holidays means lots of extra cooking, cleaning, and bathroom use. For those households with newer and upgraded plumbing, this may not be as much of an issue, although still one to be mindful of. On the other hand, for older homes that haven’t had any recent plumbing repairs or upgrades, extra cooking, hand washing, and bathing could take a toll on your kitchen and bathroom sinks. Clogged Kitchen Sinks: It can be hard enough to keep the drain in your kitchen sink clean, even when you don’t have guests staying with you, but when you have a house full of people you can’t monitor every little thing that goes down the drain. Stringy foods, fibrous and crunchy veggies, meats, grease, and of course, soap scum, can be hard on the disposal and may clog the pipes. And worse, for those who don’t have a garbage disposal installed, anything of substance that goes down the drain is a potential threat that may cause a clog, or even worse, a major back up in the plumbing. Clogged Bathroom Sinks: With the excessive amount of sink use in bathrooms during the holidays, these become clogged quite easily. Maybe a cotton ball escaped down the drain or clumps of people’s hair have become lodged in the pipes, causing a clog or slow drainage. Whatever the case may be, there are ways to avoid clogs in your sinks. Solutions: To avoid clogs in the kitchen sink, make sure all of your guests understand what can and can’t go down your drain, and let them know whether or not there is a garbage disposal. Keep a bucket next to the sink to dispel tougher foods in that can then be thrown in the garbage can or composter. To deter clogs in the bathroom sinks, purchase a drain guard that can cover the drain in the sink to protect your pipes from clogs caused by hair and other items. Ah, the toilet—one of the world’s greatest inventions, and one that suffers from all kinds of issues when overworked and treated improperly. These porcelain thrones tend to cause all sorts of disasters for people, especially during the holidays and in households full of guests. Clogged Toilet: This is one of the most common plumbing problems during the holidays because you can’t really monitor what visitors flush down the toilet. Kids love experimenting with these items and will flush all sorts of things that can cause a clog. Whether someone used too much toilet paper or flushed baby wipes, face wipes, or cotton balls, clogs can happen quite easily. Toilet Keeps Running: When a toilet is used a lot, the water in the bowl may take longer to fill, which can sometimes be fixed with a jiggle of the handle. This usually means the flapper isn’t closing, which allows the water to continue running. Solutions: To avoid a clogged toilet, set a trash can near the toilet that is clearly visible so that people can toss unflushable items in the trash can. Keep a plunger handy either stored under the sink or off to the side of the toilet where people can see it. If the toilet keeps running, try jiggling the handle. Remove the lid to make sure the flapper isn’t stuck open and that the chain isn’t kinked or tangled. Adjust each as necessary to stop the water from running. 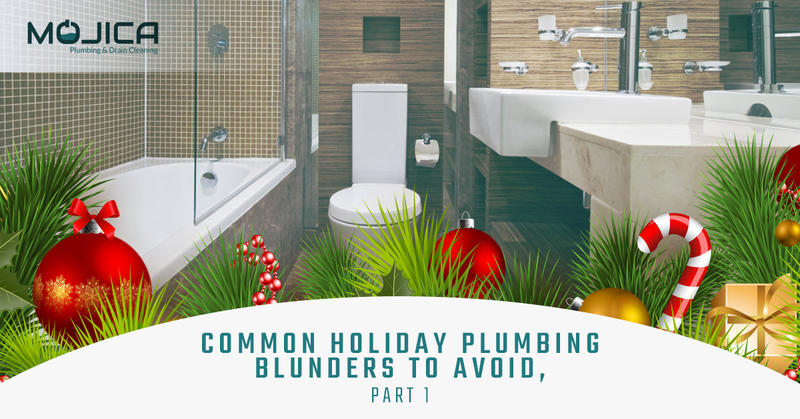 These are just a few of the common plumbing problems that happen during the holidays, so join us next time as we continue looking at more plumbing problems and solutions. Should you experience a plumbing emergency during the holidays that requires a pro, call Mojica Plumbing and Drain Cleaning! As your reliable and friendly plumbers in Austin, we will come to the rescue so you can get back to enjoying the holidays.